There is growing evidence of the protective role of the Mediterranean diet (MD) on cancer. However, no prospective study has yet investigated its influence on lymphoma. 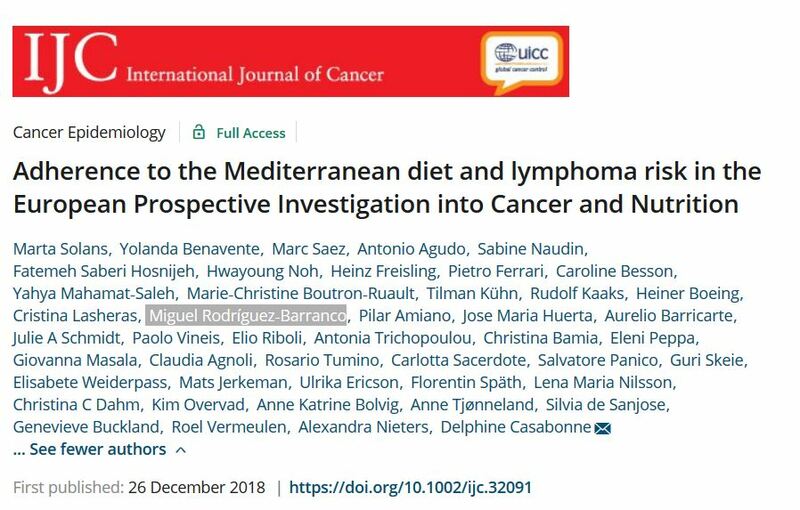 We evaluated the association between adherence to the MD and risk of lymphoma and its subtypes in the European Prospective Investigation into Cancer and Nutrition (EPIC) study. The analysis included 476,160 participants, recruited from ten European countries between 1991 and 2001. Adherence to the MD was estimated through an adapted relative Mediterranean diet (arMED) score excluding alcohol. Cox proportional hazards regression models were used while adjusting for potential confounders. During an average follow‐up of 13.9 years, 3,136 lymphomas (135 Hodgkin lymphoma (HL), 2,606 non‐Hodgkin lymphoma and 395 lymphoma NOS) were identified. Overall, a 1‐unit increase in the arMED score was associated with a 2% lower risk of lymphoma (95% CI: 0.97; 1.00, p‐trend=0.03) while a statistically non‐significant inverse association between a high versus low arMED score and risk of lymphoma was observed (HR: 0.91 (95% CI 0.80; 1.03), p‐trend=0.12). Analyses by lymphoma subtype did not reveal any statistically significant associations. Albeit with small numbers of cases (N= 135), a suggestive inverse association was found for HL (HR 1‐unit increase= 0.93 (95% CI: 0.86; 1.01), p‐trend=0.07). However, the study may have lacked statistical power to detect small effect sizes for lymphoma subtype. Our findings suggest that an increasing arMED score was inversely related to the risk of overall lymphoma in EPIC, but not by subtypes. Further large prospective studies are warranted to confirm these findings.